The automatic regeneration process in most vehicles works by the ECU constantly monitoring the flow of exhaust gasses through the filter, and at a specific point it will initiate the procedure. This involves increasing the amount of fuel added to the induction system which in effect creates a fire in the diesel particulate filter (DPF), burning off the excess soot and blowing the ashes out of the exhaust pipe. Regular long journeys at high speeds create a higher running temperature and free flowing exhaust gasses which are not ideal for automatic regeneration. Also, if like a lot of people, you only use your vehicle for short local distances, it is unlikely that the vehicle will automatically regenerate the DPF filter. This is normally when the DPF light on the dashboard comes on, but before you spend any money it’s worth trying the manual regeneration procedure. First check to see if there are any instructions in the owners manual regarding DPF regeneration. If there is no information in the handbook or if you don’t have access to one you can follow these five simple steps which will work on most vehicles. 1. Make sure that the Engine Management Light is not on and that there is at least a quarter of a tank of fuel. 2. Turn on as many electrical items as possible; air conditioning, lights, heated seats, heated rear window, etc. This will make the engine work harder. 3. 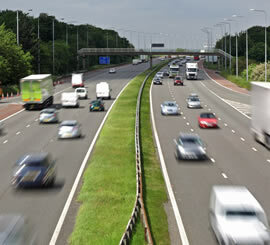 Find a stretch of road where you can maintain a constant speed for 30 miles without stopping, i.e. a motorway or a dual carriageway. 4. Make sure that the vehicle is at a normal temperature and then drive in any gear that you can maintain 2,000 RPM at a constant speed, automatics should be placed in sport mode where applicable and the gear should be selected manually. 5. Drive the vehicle at a constant 2,000 RPM for approximately 30 miles. If you follow these simple instructions the vehicle should regenerate the DPF filter automatically without costing you any money. However, if the DPF light remains illuminated after attempting a manual regeneration the filter will require professional cleaning. If your vehicle has switched to 'limp' mode it will not be possible to regenerate the DPF filter automatically and will need to be professionally cleaned. DPF Cleanse offer a quick, hassle-free service for cleaning DPFs, with experienced technicians and more than twenty years' experience in vehicle servicing and maintenance. Your DPF can be courier collected, professionally cleaned and returned to you within 2-3 days, or customers can visit us at our Lancashire workshop. Contact us today to make an enquiry and arrange an appointment. All modern diesel powered vehicles are fitted with a Diesel Particulate Filter, or DPF, which is a device designed to remove diesel particulate matter or aerosolised diesel exhaust pollution particles. During combustion of the fuel and air mix, a variety of pollutant particles (generically classified as diesel particulate matter) is produced due to incomplete combustion. The composition of the particles varies widely dependent upon engine type, age and the emissions specification; a diesel car or truck equipped with a fully functioning DPF filter will not emit the visible black smoke from the exhaust pipe. However, filters of every kind have a finite capacity and these filters are no different. DPF filters must be kept clear of accumulated soot. In order to achieve this, the vehicle's onboard computer system (ECU) constantly monitors the state of the filter by measuring the exhaust pressure entering and leaving the DPF, and is then able to calculate the state of the filter and the point at which it needs to undergo auto regeneration.